December 6, 2009 By Paul & Vernon Mayer & filed under Last Minute Woodworking Gifts, Plans and Projects, Woodworking Projects. Add a whimsical air to your next celebration by placing wine bottles in a seemingly impossible balancing act using these intriguing holders. These special holders support a standard 750-ml bottle of wine in perfect repose, while your guests will stand around it staring in a state of wonder. 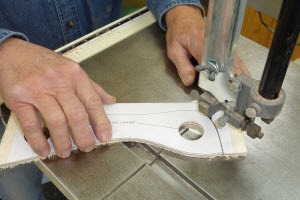 The trick to maintaining balance is in the angle of the base cut, and the distance from the top hole to the base. This plan will demystify the process and take the guesswork out by providing the measurements that make it work for you. Start by creating your template. Download and print the supplied pattern, and apply to 1/4″ plywood or tempered hardboard using adhesive spray. 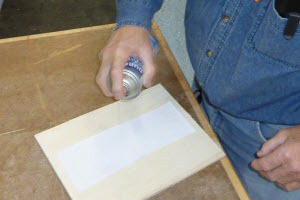 Let the spray dry for about a minute before placing it on the template material, which will allow the paper pattern to be removed more easily. Cut out the template. First drill the 1-1/4″ holes as indicated on the template. 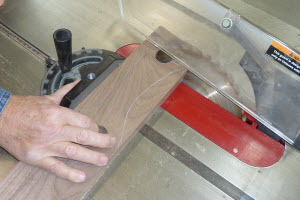 Then, use either a band saw or scroll saw to cut to the pattern lines, and sand the edges smooth. Prepare your stock. Any hardwood will work just fine. This is a perfect project to turn end cuts into holiday gifts, as the blank that you will need is only 3/4″x 3″ x 9″.Optionally, for greater stability you can use thicker stock such as 5/4 or 6/4. Trace the cut lines using the template. 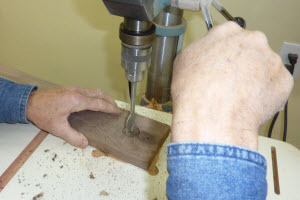 For better visibility, using a white pencil when using dark wood such as walnut. Drill holes. 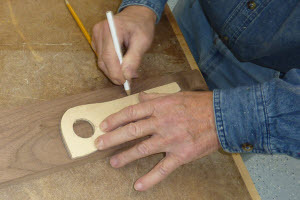 Use a 1-1/4″ bit to drill holes as positioned in the template. The bottom contour could also be cut on the band saw, but given the tight radius we generally do this at the drill press, which provides a quick hole that is consistent in size with the top hole, and leaves a smooth surface that saves on sanding time later. Cut the base angle. 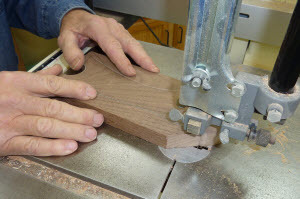 Prior to cutting the curved shape on the band saw, cut the base at a 35-degree angle. Cut rough shape on band saw. Using a band saw, cut the curved shapes, leaving the line for final shaping later. At this point it is a good idea to test the holder for balance. 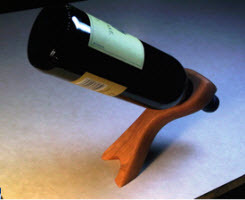 Before sanding, place a full 750-ml bottle of wine in the holder to see if it stays firmly balanced. You might find that it balances perfectly without further modification. If you are slightly off, it might feel ‘a bit tippy’. If you are grossly off, it won’t stand on its own at all. 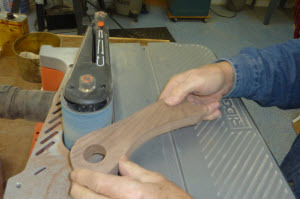 If it doesn’t balance properly, carefully feel which way the holder is leaning under the weight of the bottle and adjust the angle of the base with ‘tuning cuts’ on band saw as needed, or by lightly sanding with a disc sander. 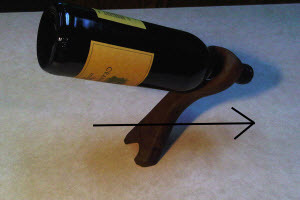 If the bottle leans to the right as shown by the arrow in this photo, decrease the angle of the base cut (try 34-degrees) so that the bottle holder stands more vertically. Sharpen the angle (try 36-degrees) if it leans the other way. Sand to the line. 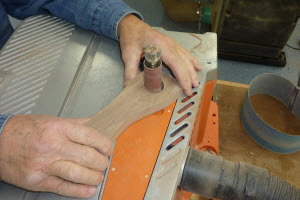 Using a belt sander, carefully sand to the line for final shaping. 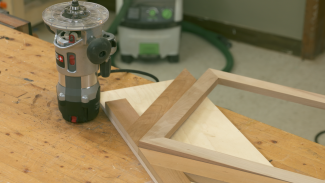 Use an oscillating spindle sander or other means to sand inside the holes. After all surfaces have been sanded using power equipment, hand sand to 400-grit to achieve a smooth feel. Finish using polyurethane or other durable finish. One way to support small pieces like this as the finish cures between coats is to tap some small finish nails about half way into a piece of scrap wood, leaving a bunch of nails sticking out a small amount at approximately the same height. 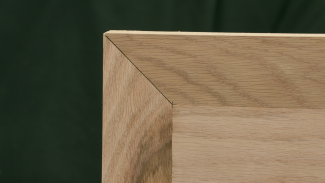 This will support the piece without much contact surface area, allowing you to finish all sides in a single pass. Once you get the balancing part down, you can experiment with other fun shapes and designs. If you modify the distance of the hole from the base, you will also have to adjust the angle of the base to establish balance. For example, if the hole is farther from the base, you will need to cut the base at a lesser angle. By experimenting you will find the angle that works for most any design. 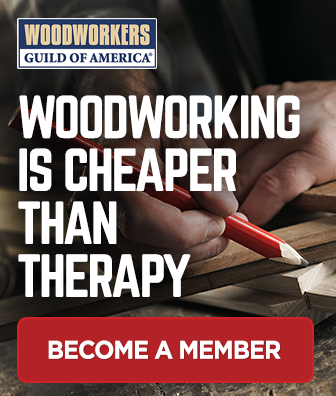 Paul Mayer lives in Lakeville, Minnesota, and is a hopelessly addicted hobbyist woodworker with 12 years experience building custom furniture and other fun projects. 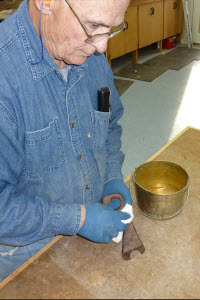 He also assists his father, Vernon Mayer, in his woodworking business Vern’s Wood Goods where they build serving trays, cutting boards, kitchen utensils and other fine crafts. Will have to try this only using a scroll saw and a dremel for sanding. Hope it works as your did! Hi John. It is 8″ tall overall. Hi, John. Please contact us at 1-855-253-0822; our Customer Service Team would be happy to assist you! I printed PDF out on landscape, it measures 8 1/2 inches long point to point, center to center of the holes is 7 inches. Where do you measure for the 8 inches? I called the number for customer service. They advised to send a message, they could not answer the question. How do you get a 8″ pattern? Every time I try downloading it it comes out 5″ no matter what I try?? Hi, John. Please contact us at 1-855-253-0822; our Customer Service Team would be happy to help. Hi, Connie. It is for the longer side, which is the front of the piece. Thanks! Cut my first one this evening and it works! Have been making the so called booze fish bottle holder for a couple of years now. Always a big seller at craft shows. People think it’s nailed to table and I tell them to pick it up. Good for some laughs when they see it’s not. Hi, John. The best thing to do is to use very light cuts and dial it in via trial and error. There is a photo/section in the article that explains how to adjust your cut depending on which way it is tipping. realmente fastidioso pedaçߋ de escrita na construção de novos web site. Looks like a really interesting design. 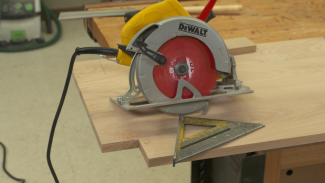 Is the hole always at 90 degrees to the surface of the board (and therefore you vary the cut at the base), or do you vary the angle of the hole on the drill press as well? Hi Robert. I have always cut the hole at 90 degrees. That’s not to say that you couldn’t experiment with different angles at the drill press. I would like a copy of the print for this project. Hi Randy. Make sure you are logged into your account and then you can click on where it says Click here for the Balancing Wine Bottle Holder Plan. If you have any questions please contact our customer service team at 1-855-253-0822. I have opened and searched and searched this plan and can’t not seem to find the template link? Please Help, or Help Please. Hi Pat. To view the plans you will need to be logged into your account with your username and password. If you have any questions, please contact our customer service team at 1-855-253-0822. My security software is warning me not to download these plans. Is there a safe method to get the download? Hello. Here is the link to the download. If you are still having issues please contact our customer service team at 1-855-253-0822 and they can assist you.